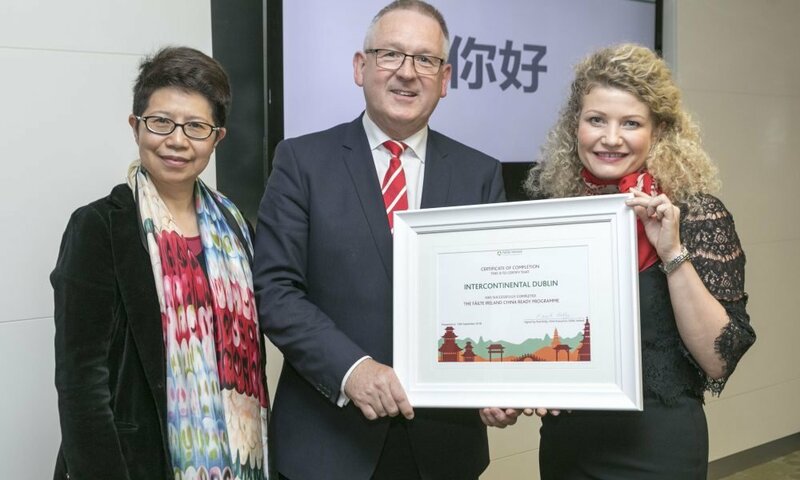 The InterContinental Dublin is the first 5-star hotel in Ireland to complete Fáilte Ireland’s Get China Ready programme. The programme is aimed at educating Irish tourism businesses about the opportunities available from the Chinese tourist market and is part of Fáilte Ireland’s work to assist tourism businesses with market diversification and reduce the risks currently posed by Brexit. The programme is an initiative of Fáilte Ireland in co-operation with Tourism Ireland and Tourism Northern Ireland. Above are Madam Wang, First Secretary, Head of Culture and Tourism, Chinese Embassy in Ireland; Paul Keeley, Fáilte Ireland; and Agnes Arendarczyk, InterContinental Dublin.